In the following pages, I share my story as a licensed professional counselor who was a Christian in search of deeper theological integration. This journey began for me as an aspiring marriage and family therapist working in community mental health. It has led to my present work as a biblical counselor at the Christian Counseling & Educational Foundation (CCEF). Join me as I journey from skepticism and distrust to eager and joyful embrace of biblical counseling. My first contact with biblical counseling came as a young undergraduate student majoring in psychology at a Christian university. 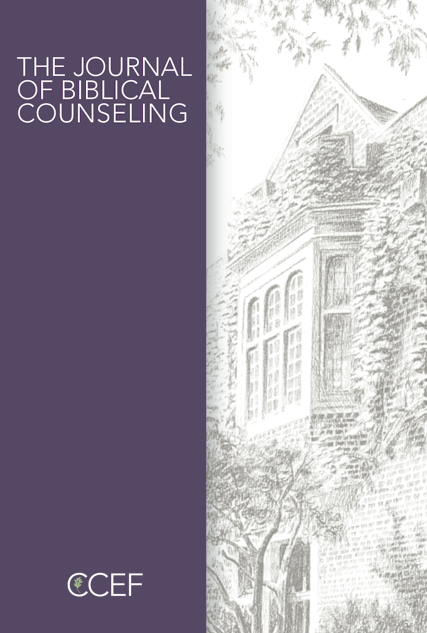 In a class surveying Christian counseling approaches, Jay Adams’ writings in the early 1970s were used to typify biblical counseling. I remember bristling a bit at his confrontational writings and seemingly narrow focus on behavior, sin, and repentance. As a final project, students were asked to choose one Christian approach to counseling and defend it in written form. As far as I know, not a single student in the class embraced biblical counseling or believed he/she could defend it in good faith. To our bewilderment, the professor alleged that if we were to observe Adams in session, we would perceive many more similarities than dissimilarities as compared to other prominent Christian counselors. Still these early writings seemed irreconcilably to distance us from taking an interest in the biblical counseling movement. We viewed biblical counseling with an eye of suspicion. Personally, I carried this reservation with me through graduate school and into my professional counseling practice. Many Christian counselors can recall a similar past experience with biblical counseling that soured any possibility of greater engagement with this movement. My story is not unique or exceptional in this regard. Some have written off biblical counseling as irrelevant or simplistic while pressing on to find guidance and methodology within the psychologies. A few others, like myself, deafened our ears towards biblical counseling, but through years of counseling practice and personal faith found ourselves taking a second, wondering glance over our shoulders. My desire is to articulate the deep sense of dissatisfaction that many clinically-trained Christian therapists harbor in their hearts: they yearn for greater continuity between their faith and their counseling practice. The questions and experiences I pondered are common to many Christian counselors who struggle at the intersection of their Christian faith, their secular training, and what transpires in the privacy of their counseling offices. As long as we practice, we will continue to work out these questions. Yet, we are not on our own. Others have gone before us, and many of those others are “biblical counselors.” For decades many thoughtful and gifted theological counselors have struggled to develop a distinctly and thoroughly gospel-centered “psychology,” an approach to people and their problems that arises from Scripture. There has been momentous progress since the days of the often-maligned, early biblical counseling literature. Yet sadly, many Christian counselors have never looked back at biblical counseling. They continue to miss the significance of the initial conception and the depth and richness of the state of the art. I am grateful that I took a long second look. Thirteen years ago, I cut my teeth on counseling in a rural South Florida community. And it sure hurt. I was hired to do child and adolescent counseling with high-risk families. The county was routinely involved in an attempt to stop and prevent further child abuse and neglect. Within a few months of devoted involvement with these nightmarish families, I began to struggle with chronic generalized anxiety, stomach pain, and moderate panic. I had underestimated the complexity, difficulty, and burdensome nature of the career I had chosen. I dearly wanted to help these families but knew I was ill-equipped. And I needed help myself. It is not unusual that this professional endeavor is also a personal endeavor. I applied and was accepted into a family therapy program at a leading Christian graduate school. There I studied psychology, theology, and their attempt to integrate the two. Deep down, I enjoyed my theology classes more than my psychology classes. To my surprise, they richly addressed complex human struggles at a profounder level than my psychology classes. With psychology, we were existentially alone, and at best, connected to others in this fragile isolation. Theologically, I relished opportunities to ponder the truth that there was One who was near, whose eyes saw everything, who was at work rescuing his people, and who spoke true words of life. Yet, my psychology classes were technique rich. They proved so helpful in learning to ask thoughtful, expansive questions. They provided me with skills to be with people who were hurting and struggling. I was eager to learn from men and women who had dedicated decades of their professional lives to studying specific clinical areas. They taught me what to be aware of, what directions might be helpful to take, and how to see the forest for the trees. Here I garnered much insight into powerful influences on the human soul: physiology, environment, personality, family systems, etc. During graduate school, I entered therapy with a gifted and wise Christian psychoanalyst (the counselors with the couch). Here the Lord challenged, comforted, and grew me in ways that were far-reaching. For this I am earnestly grateful. Spending hours on the couch opening my heart and life to one to whom I had entrusted the care of my soul was greatly beneficial. Those years as a “client” –a struggler—taught me more about counseling, relationships, and ministry than any one class or book. And it grew a spirit of humble dependence upon others whom God had placed around and over me. Experiencing growth and healing first hand motivated me to continue my professional pursuits. Unfortunately, this inspiration did not withstand the rigors and climate of the field. After working for two years in community mental health, I withdrew altogether from the mental health field. Disheartened and disenchanted with the therapeutic community, I joined the ranks of the many one-time therapists. Working in counseling had increasingly felt confining. I was ill-at-ease with the pressure I experienced as a therapist seeking to bring change into complex and intractable situations. The stress of serving high-risk, volatile families was exacerbated by the intra-office conflict and competitive organizational dynamics that seemed to pervade the field. Everyone cared so deeply. Each held fiercely to his/her brand of psychology. The field as a whole seemed uncomfortably liberal and “tolerant”—even while being highly competitive. And for Christians and the Christian faith, there was vehement intolerance. Yet, I was always surprised to find this discipline so populated by Christians. It surprised me because I personally felt alienated, and my Christian faith seemed like a strange bedfellow within clinical and academic psychology. Knowing that I was former therapist, a wise elder in my church graciously engaged me in discussions comparing my view of people and change with a biblical counseling view. During my years in graduate school, I had studied human anthropology and personality. Yet his sophisticated, gospel-centered explanations and applications to deep and complex human problems dissolved my intellectual confidence. The gospel passionately applied with precision and nuance left me astonished and increasingly assured of my ignorance! How could I have gone through four years at a graduate school that was part of seminary never having explored the depths and breadths of the gospel as applied to specific counseling issues? The most profound and researched psychological perspectives that had seemed so attractive, that seemed to offer penetrating insight, now appeared two-dimensional against the three dimensional biblical descriptions. Alongside biblical explanations, psychology’s answers to the fundamental issues that underlie every psychiatric condition (suffering, guilt, shame, fear, death, anger, responsibility, etc.) came up wanting. In these conversations with my elder, my disaffection with the psychologies grew even as my joy multiplied in seeing rich practical theology applied to counseling. As if beginning to see clearly for the first time, Scripture began to shine beautifully and powerfully into each of counseling’s complex issues. This was just the beginning of the comfort available in the gospel. During one of these conversations, my elder promised to cover my expenses if I joined him at CCEF’s annual conference. I hesitated. Those early interactions with biblical counseling had left a deep residue of wariness that remained even as my interest grew. The model had seemed overly simplistic and indifferent to exploring the many complex, shaping influences in a person’s life. It was hard to shake my apprehension that biblical counseling continued to underestimate motivation while narrowing its scope to behavior and cognition. Would prayer, worship, repentance, and deliverance be used as panaceas in an attempt to accelerate the slow, relational context of change and growth? Making this decision to attend the annual conference was even more difficult when a family friend, trained in an offshoot of biblical counseling, presented me with lists of Scripture verses to give to people with particular struggles (anxiety, depression, anger, etc.). I sensed the complexity of my own struggles, and felt it disingenuous and premature to approach people in this seemingly superficial way. “You struggle with depression? Memorize these five verses about joy.” What’s more, my clinical training was still met with suspicion from certain pastors with whom I had contact. Seemingly, they looked at the entire spectrum of psychology and saw no benefit or merit. I felt like an enemy, not a brother. I found these “biblical” practices and attitudes off-putting and unpalatable. Yet, in spite of these concerns and experiences with biblical counseling, I reluctantly agreed to attend CCEF’s annual conference. I still remember my thoughts while preparing to hear the first plenary speech. Looking around, I found myself surrounded by pastors, lay counselors, and other would-be counselors (only a few of whom had been clinically trained). Proudly, my thoughts turned suspicious as I quietly doubted my inclusion in this group. What do these people know about doing therapy? Would they know how to treat a manic-depressive or understand the complexities of systemic relational dynamics? But for all my reluctance to trust this new community, I committed to keeping an open mind and struggled to remove the wedge that my pride had driven between biblical counseling and me as a professional counselor. The speaker welcomed us from the podium and before he finished speaking, the Lord humbled me. The guardedness drained from my heart. I had been to many psychological conferences over the years. But none were like this. Where was the competitive vying for attention and recognition? Where were the self-protective jurisdictional and expertise vibes that came part and parcel with these conferences? I was accustomed to being in a room of therapists where each integrated a unique blend of psychological theory, technique, and personal spirituality. Each sincerely thought his/her eclectic blend was more cogent than the next. Yet here I experienced humility, graciousness, and authenticity. No one clamored to be heard or to promote his/her unique counseling blend. These were not amateur counselors incompetently meddling in a field outside of their jurisdiction. For the most part, they were a group of gifted and deeply caring believers desiring to grow in their own lives, in wisdom, and in skillfulness in helping others. There was a unifying gathering around Christ and his good news as applied to the many problems of living. And these gospel applications addressed the counseling complexities in ways I had never imagined before. The speakers and participants did not speak about a technique or an intervention but about a Person who changed all of reality. They spoke of Christ in a way that meaningfully addressed Schizophrenia, Bipolar, or persons diagnosed with Conduct Disorder. This was disarming. I started to see the potential. The seminars were personal, gospel-focused, and spoke to the depths of MY life and relationships. To be so personally implicated was a pleasant surprise. I quickly realized that I was not going to leave this conference merely knowing better how to diagnose and treat OTHERS. Even more apparent was the sense that the speakers had a different starting point—theological convictions that I shared, but that I did not know how to make operational. They first mined rich theological truths, themes, and narratives and then from this vantage point addressed people, relationships, and disorders. I was accustomed to the reverse. I was familiar with learning from Christians who were trained experts in psychology but had proportionally less theological vision. When this was the case, psychology always carried the agenda. This was true in my own life as well. I had an undergraduate degree, a graduate degree, and postgraduate training in psychology. In theology I had some introductory Bible college and seminary classes, two integration courses, and was predominantly self-taught. I had earnestly strived to filter out ideas and interventions that seemed clearly unbiblical, but my guiding theories, anthropology, and techniques remained principally secular. I felt largely unassisted and ill-equipped to think biblically about people, about psychiatric problems, and about change. If I were to peel away the Christian moralism (do this…don’t do that…) and means of grace (prayer, the use of Bible verses & narratives, etc.) on the surface of my counseling, psychological world views with passive motivational theories (why we do what we do) remained the operative essence of what I did. At the end of the day, my own counseling essentially boiled down to secular eclecticism. Nevertheless, I yearned for a deeper, biblical foundation to counseling. I knew that my own “integration” lacked true depth. I wanted to learn from others how theologically to understand and wisely address motivation, behavior, cognition, relational dynamics, physiology, and emotion. And I knew that personal spiritual growth would not necessarily or sufficiently aid me in constructing a faith-based psychology. Even from my early days in this field, I felt uneasy with Christian academics who adopted and promoted secular theories with Christian reinterpretations. I knew there was much good in secular theories and observations. However, at the end of the day, they all came up short. Each attempted to make sense of humanity apart from our Creator, our life-giving Sustainer, our Judge, our Rescuer. It was at the CCEF conference that I first caught a glimpse of a well-developed “faith psychology” that did more than repackage secular theories. I left longing to learn more from these men and women who had mined rich gospel truths, implications, and applications. I remember thinking, “If I could counsel in this context, I’d do it for the rest of my life.” What a breath of fresh air! This was a watershed moment for me as I began to reconsider counseling. Eight months later I returned to the field working in an inpatient psychiatric hospital. On the surface my counseling looked very similar. But inwardly, the way I saw counseling was transforming. Through exposure to biblical counseling, I began to see people differently and ask new questions. But even though I asked different questions, I still felt a bit inept to answer them well. For example, I worked for many weeks with a woman suffering greatly from a severe traumatic brain injury. In an attempt to kill herself, this woman had stepped in front of an oncoming truck. She survived this suicide attempt but came out with a broken body and severe brain trauma. A year or so after the accident, she was admitted to our psychiatric hospital as a danger to herself and others. She was a very angry woman, even cruel in many ways. She beat her children, berated her husband (who at least was quicker than she), and used her moods and words murderously and suicidally. The attending psychiatrist prescribed large doses of tranquilizing medications in an effort to keep her and those around her safe. Even so, this woman provoked daily hospital-wide stat emergencies. She incited our use of physical restraints, intravenous tranquilizers, and the isolation room. Experienced nurses and caring mental health workers were injured—one severely. I floundered for answers within psychology, but what was offered left me wanting. Theologically, I was shaken up. Could a person go from being an average, working citizen to being cruel, mean-spirited, and violent from a physical brain injury? Did her altered and debilitated neurology have this moral power? Or was there something else at work here—something spiritual and willful? Did the brain trauma cause this bad behavior or incapacitate her ability to manage that which was at play in her heart? Where was hope for this woman? And how could I speak relevantly into her life? Sadly, I found myself fearing her more than loving her. In retrospect, I remember this woman’s husband speaking differently to her than all of us mental health professionals. When her moods escalated, he directly addressed her—risking his own physical safety. He scolded her and challenged her to behave while the rest of us backed away. And to my surprise, she heard him and often responded well. He was more courageous and effective than the rest of us trained professionals. Somehow he understood that her brain injury did not fully explain her fitful rages. And he cut through the tantrums to speak to her conscience. Similar scenarios played out each day as we worked with people suffering from dementias, strokes, and other psychiatric problems. I listened to the answers from psychology and psychiatry. My colleagues were compassionate. But their answers came from a mental illness/biological model. The medical model could not address the “works of the flesh” (Galatians 5) that we experienced and dreaded each day. These were clearly moral behaviors and not physical weaknesses. Approaching patients from a fundamentally biological lens restricted us from addressing and apprehending actual sinful behavior. In my own counseling practice, most of my own technique and theory had come from statistically effective interventions and well-researched systems of ideas. Yet many of these ideologies struck me as a bit out of tune. Inwardly, I longed to enlist techniques and conversations that were based on truths that I could sing in church or pray on my knees. In fact, I sincerely struggled to know how to pray for my counselees. When I tried, words that echoed my in-session conversations stuck in my throat. “Lord, strengthen Mary’s sense of boundaries between her and her critical husband.” “God, teach Jessica to identify, challenge, and restructure her maladaptive cognitive distortions.” “Jesus, give Jimmy the ability to securely attach to his mother.” “Spirit, protect Sylvia from emotional dysregulation.” Attempting to pray in the same direction, categories, and language that I was utilizing in therapy seemed inappropriate and awkward. In the end, I gave up and prayed more for myself as a counselor than for those with whom I met. “Lord, give me much needed wisdom today as I work with Mary and Jimmy.” And yet, I longed to speak to clients in ways that spoke to me. Most often, the counsel I gave was uncoupled from the Truth I desperately needed and staked my life on. I longed for eternal Truth in counseling, not just truths that sort of worked, that worked for ME, or that happened to be the therapy du jour. I longed to embrace true authority—not for my own sense of counseling control but authority under which I submitted my own thoughts, feelings, and behaviors. I longed for the grace and mercy—not just the kindness I could sometimes show counselees, but the grace we BOTH needed. This struggle for coherence and integrity was more than a professional problem. Before entering therapy myself, I had devoured a book written by a leading Christian psychologist. He taught me relaxation techniques and targeted cognitive distortions. He spoke of using prayer as a means of calming and re-centering myself. But approaching my anxiety on a physiological level felt like a cosmetic remedy. My pervasive anxieties did not capitulate to reason. Although prayer and Bible verses surrounded his ideas and techniques, they were essentially cognitive behavioral. Sure, I experienced a bit more calm, but my sinful and active heart was never challenged. I was never encouraged to explore the deep, sinful desires that ruled me and when threatened, fueled my anxiety. I could better “manage” my anxiety through the techniques and ideas that relaxation and cognitive therapy provided. But biblically, my anxiety was not a holy anxiety. The most profound remedy came through searching my heart and examining my mind. Change came in repenting from that for which I so fiercely lusted (pleasing others, placing confidence in my own wisdom, power, performance, and righteousness), and in turning humbly to the One who was worthy of my adoration, who reinterpreted all my fears. I was desperate for something more powerful and more personal. I needed prayer to be a living relationship not a psychological technique. I needed One who was bigger and stronger than my fears and worthy of my devotion. The psychological theories I had learned and utilized never led me to Jesus. In fact, they felt like parallel tracks (psychology and Christianity) that appeared to intersect on the horizon. But as I walked on, they never met. The psychologies place the individual or his/her relational system at the center of the universe. Each encourages the protection and promotion of the individual and makes what “I” want, need, deserve, feel, and think focal. Self-centeredness and self-reliance is engendered. But which of the psychologies leads to and reveals the gospel? As believers, we develop “an ear” for the gospel. And something moves deeply within us each time we hear the gospel melody in our lives and in the lives of those around us. Why don’t we hear this rich melody in the psychologies? What place does forgiving others as the Lord forgives us have in systems theory? Does Cognitive Behavioral Therapy aid us in determining Christ-defined rationality or irrationality? Does it open our eyes and hearts to the Lord who is near and before whose eyes we live? True rationality leads us out of our world of self-talk and into a conversation with the God who intends us to know him, need him, and love him. Does personal need theory guide us to putting to death the lusts of the flesh or to considering others and their interests as more significant than ours? Each monochromatic psychological theory is idolatrous in its own way, and not only does not lead us to a compassionate, gracious, and just God, but in fact keeps us from him. Allow me to clarify. Studying and learning from the astute observations of the psychologies was helpful. Thousands of thoughtful counselors are in the trenches each day comforting, challenging, and attending to people in need. And these counselors have something to teach us. But we must not embrace the anthropologies and philosophies upon which the secular theories and interventions are built. Clearly, the psychologies never address our willful hearts of worship that cherish and defend idolatrous and adulterous passions. They excellently examine many things but are blind to deeper things. They are mindless of that which is most important—the soul before the living God. At the end of the day, our counseling falls short if we’ve addressed physiology, family history, trauma, systemic influences, etc., but have not done so in relation to our Creator, Judge, and Redeemer. Even if our clients experience certain positive change in their lives, we fail them if we do not help them to examine their active, willful, and sinful hearts. We fail if we do not help them understand their sufferings through God’s eyes. We fail if we do not help them find God’s precious mercies. Regretfully, I look back and wince at some of the things I’ve said to other Christian therapists as I struggled along this journey to integrate faith and psychology. “Scripture is not really about the same “stuff” as psychology. The psychologies are distinct and specialized topics of study.” “The Bible is not a therapy manual. It doesn’t teach me what to do in session.” “The Bible doesn’t study and speak to the diagnoses and specific cluster of symptoms that I see in the counseling office.” “Go to a good state university to learn how to counsel.” Even as I had argued along these lines, I had felt a bit uneasy. There was always a gnawing intuition that Scripture indeed addressed the same “stuff” that psychology took in hand. Surely, I could not deny that it did in my own life. God continued to reveal to me the depth of his Word to reach the human heart and the things that war within and against it. As that happened, I continued to grow in my passion for biblical counseling. I wanted to learn more. I wanted to apply it to my work as a counselor of others. So, with my wife’s support, we packed up our belongings and drove out to Philadelphia for further training at CCEF. Learning biblical counseling was like breathing fresh mountain air. The faculty applied the profound and simple (not simplistic) truths of the gospel of Christ to the human heart and behavior. After finishing my studies, I stayed to complete a counseling residency where I had the opportunity to flesh out what I was learning by counseling, teaching, and writing. For the first time in a long time, counseling is consistently life-giving. At any moment in session, I really could switch places with those I am counseling. To one extent or another, I need the same truth I am offering. There is little self-protective distance. Hypothetically, every sentence could start with “We.” Instead of being a licensed expert with a technical knowledge of specific disorders and their treatments, I am a family member, a servant, and a steward. Almost daily, I tremble listening to those whom I counsel, knowing that I too am weak, needy, and sinful. And just as frequently, I have opportunities to be challenged by, to stand in awe of, and to learn from my counselees who are growing in “faith expressing itself through love” amidst suffering, encumbering weakness, and temptation. Returning to where I began this journey—as an undergraduate studying psychology at a Christian liberal arts college, I remember learning about “biblical” counseling. But it was presented as a fringe movement of Christians who rebuked just about everyone who walked through the counseling door. Sadly, there was probably an element of truth to that caricature. I too have met counselors who call themselves “biblical” but who are otherwise offensive, overly simplistic, and insensitive to people. Had this been my experience at CCEF, I can assure you that I’d still be a “former” therapist. Remarkably, I have been warmly welcomed and my clinical training has been widely valued and redeemed. The transition to biblical counseling has been slow, at times circumspect, but always full of joy and personal transformation. And if the Lord wills, I’ll continue to grow and work as a biblical counselor for years to come.